Scott Turner and Gary Hill from the Division of Computing an Immersive Technologies of the University of Northampton UK,have been investigating teaching and developing problem solving skills as a first step developing programming skills through the use of LEGO-based robots and graphics based programming. Work on problem-solving has been on-going in the School of Science and Technology (was School of Applied Sciences) for the last four years looking at the concept of teaching and developing problem-solving first, then programming. 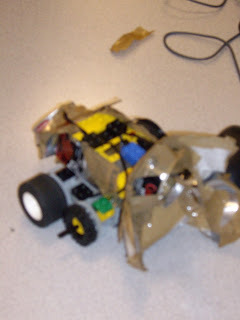 The main vehicle for developing the problem-solving skills has been LEGO Mindstorms robotics kits and series of gradually more challenging robot-based tasks. Lawhead et al (2003) stated that robots “…provide entry level programming students with a physical model to visually demonstrate concepts” and “the most important benefit of using robots in teaching introductory courses is the focus provided on learning language independent, persistent truths about programming and programming techniques. Robots readily illustrate the idea of computation as interaction”. Synergies can be made with our work and those one on pre-object programming and simulation of robots for teaching programming as a visual approach to the teaching of the widely used programming language Java. The main benefits that the students stated of this approach was they believe robots provide a method to visually and physically see the outcome of a problem. The approach taken the module has been visually-orientated. The appropriateness of this seems to be borne out by the student comments. Student satisfaction for a module based around this approach is over 92%. One of the comments made was that the linking of the problem-solving robot task and the programming assignment was liked. This feedback is similar to that reported by other authors when teaching programming using robots (Williams et al, 2003). There is enough scope in this approach to have different levels of complexity/functionality within an assignment task offering a basic ‘pass’ level for a particular task, but also the scope for those students that desire more of a challenge. LEGO Mindstorms Robots SIGCSE Bulletin, 35(2): 191-201.
to Teach Computer Engineering IEEE Trans. Educ. Vol. 46 pp 206. Adams, J., Turner, S., Kaczmarczyk, S., Picton, P. and Demian, P.,(2008). Problem Solving and Creativity for Undergraduate Engineers: findings of an action research project involving robots International Conference on Engineering Education ICEE 2008, Budapest, Hungary.